HONEY, I DRESSED THE PUGDoggie Ice Cream - Yes Please! Why can't it be National Ice Cream Day few times a year? One day was definitely not enough for Mr. Ari who got treated to a few cups of dog friendly ice cream by Wag! last Sunday on National Ice Cream Day. It was the perfect way to cool down during our Central Park walk on a 90 degree day. To beat this summer heat, Wag! 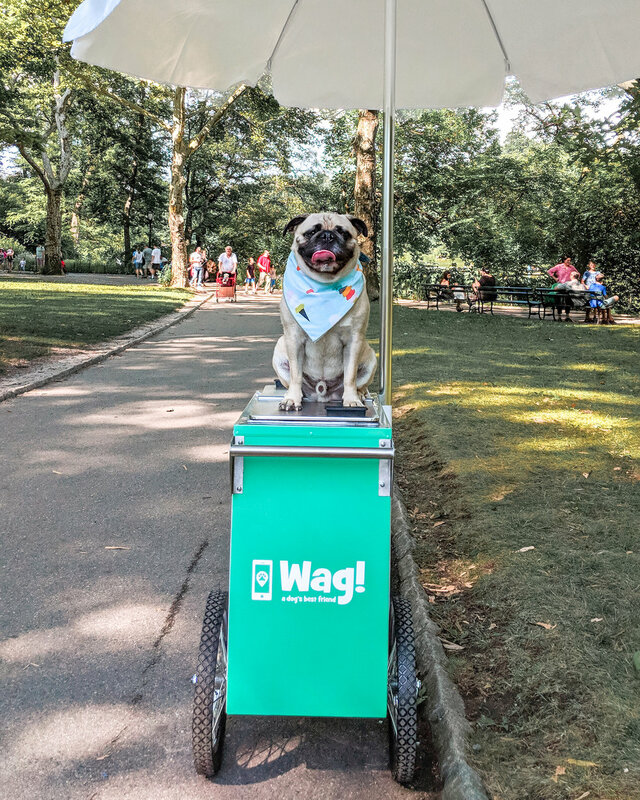 will have doggie ice cream carts around NYC & Brooklyn for the next couple of weeks. Below is a list of their upcoming locations, if you'd like to take your pup for this fun experience. Thursday, 7/19 Tribeca area parks including the Tribeca Dog Run and Pier 84 Dog Run from 3-7 p.m.
Friday, 7/20 Bay Ridge area parks including Dyker Beach Dog Run and Leif Ericson Park 4-8 p.m.
Saturday, 7/21 Prospect Park area parks including Prospect Park Dog Run and South Slope Dog Run from 10 a.m. – 2 p.m.
Sunday, 7/22 Sixth Avenue Summer Fair from 10 a.m. – 6 p.m.
We have been going for long walks before 9:00am every morning, so that we are home before the sun gets really harsh. We try to avoid mid-day walks or keep them to a bare minimum. I also make sure to always carry water with me on each walk and offer him water as soon as I see him panting or slightly exhausted. I try to walk in the shade as much as possible, in order to avoid an overheated pavement that can burn their paws. Applying paw cream regularly is a good protection against heat damage. Lastly, frozen treats are a great way to cool them down. Ice cubes or doggie ice cream or even frozen carrots covered in chicken broth or yogurt make a great treat. If your pet doesn't drink enough water, then watermelon is a great way to hydrate and treat them. Make sure to remove all seeds from watermelon as they can be harmful for pets. This post has been sponsored by Wag!